PopCap's latest title features no colored gems, nor shambling undead. Instead, it's a real-time strategy game developed by a 10-year-old. As far as young boys go, Owain Weinert is a pretty standard kid. He's 10-years-old, in the fourth grade, and he loves videogames. Like all gamers at that age, he dreamed of building his own games, and thanks to the generosity of Peggle creator PopCap Games, Weinert has been given that chance. Unfortunately, Owain suffers from acute lymphocytic leukemia, a rapidly progressing form of cancer of the blood and bone marrow. Though its status as the most common form of cancer among children offers a relatively good chance for treatment, the cancer's voracious attack is still incredibly dangerous and claims many lives each year. 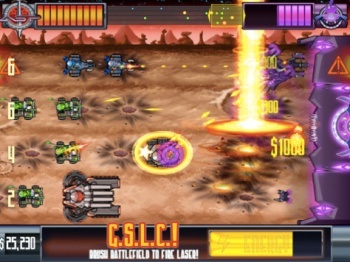 Thanks to the Make A Wish Foundation, PopCap heard about Owain's plight and teamed with the boy to develop an iOS real-time strategy game dubbed Allied Star Police. PopCap met Owain in April when Make-A-Wish Foundation of Alaska & Washington told us about his wish to make a video game. Owain (which means "little warrior" in Welsh) was diagnosed with pre-B Acute Lymphocytic Leukemia last year and has gone through lots of difficult treatments. But his dad said that what he really wanted was to hang out with "real game designers". So we volunteered to help Owain make his video game during PopCamp. PopCamp is a unique time here when folks can tinker around with interesting ideas, learn lots of new stuff and share it with everyone else at the end of the week. Well, little did we know that Owain would be our teacher and lead game designer! On the first day of PopCamp the team -- a producer, several developers, programmers and a musician -- invited Owain to our Seattle office to learn more about his idea for a video game. They were blown away when he came with a PowerPoint presentation and basically walked them through the game. Here's how his first slide began: "You are a military genius who has just been released from cryo-sleep. Your brilliance in the Lunar War convinced the A.S.P. (Allied Star Police) to put you in cryogenic slumber, just in case WWIII showed up. It's not exactly WORLD war three, more Galactic War one..."
Owain described his game in detail as he went through each slide. He had mapped out pretty much everything - storyline, unit types, firepower, shields, respawn times. We were blown away. Clearly, Owain was not your average fourth grader. He knew everything about this game. The challenge for us was how to build it in just one week. The game he'd presented would take us 18 months to create. After kicking around some ideas we decided to create a demo of Owain's real-time strategy game. The team got to work that night. Over the next week, Owain came in for another design review, giving us more feedback and game details, like unit names, cheat codes and a finished backstory. At the end of the week, Owain and his family and friends came to PopCap for an awesome release party. Since Owain's family doesn't own any iOS devices, we gave him his own fully-loaded iPad -- complete with his A.S.P. game (and, of course, other hit PopCap titles). Those of you who took a momentary break from shouting at puppies to read the above only to scoff aloud, wondering to no one in particular, "how good could a game possibly be if it was developed by a 10-year-old kid?" can sate your angry curiosity right this very moment. If you have an iPhone or iPad, you can download Allied Star Police via the iOS App Store free of charge. I was intending to conclude this piece by marveling at PopCap's generosity, but at this point, the company's random acts of kindness towards kids just aren't all that shocking. Only a month ago we covered an eBay auction PopCap held where the company sold off rare pieces of artwork to benefit sick children in the US and the UK. If I read tomorrow that PopCap found a way to launch the physical incarnation of childhood sadness into the sun, I would fully believe it. No, the really impressive part here is the game itself. I don't expect any of you to believe me until you actually play Allied Star Police, so I urge you, if you have the means, download the game. It's surprisingly good, and I say that with my cynical, game critic hat pulled down firmly over my ears. Forget how old he is, Owain Weinert has quality game design chops for a person of any age.